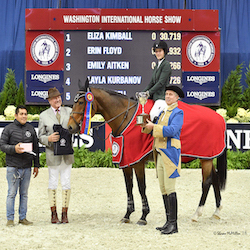 Upper Marlboro, MD – September 17, 2010 – The Capital Challenge Horse Show will host the future of equestrian sport again this year when it holds the Future Hunter divisions and the $5,000 World Championship Hunter Rider (WCHR) Emerging Professional Challenge. The Capital Challenge Horse Show begins with the Equitation Weekend, presented by Bigeq.com, held on October 2-3, and continues October 4-10 at the Prince George's Equestrian Center in Upper Marlboro, MD. Competition will be held in the outdoor ring and indoors in the Show Place Arena. Every year at the Capital Challenge Horse Show, the best up-and-coming horses are showcased in the Future Hunter divisions. Eleven years ago the Capital Challenge introduced the Future Hunter division knowing that there was a need that existed for young hunters. A majority of the winners in the divisions go on to dominate the professional hunter divisions at the best shows in the nation. Notable horses who have gone on to enjoy success in rated divisions are Hollywood, In Disguise, Dream Date, Gray Slipper, Declaration, West Point, and most recently Arabella and Showman. Capital Challenge has increased opportunities for Future Hunters this year with the addition of the $4,000 3'3” division sponsored by Pegasus Show Stable, Inc./Christa & Michael Endicott and Mr. & Mrs. Hunt Tosh. Other Future Hunter divisions include: $4,000 Future Working Hunter - 5 & Under; 4,000 Future Working Hunter - 6 & Over, sponsored by Ruth & Hal Douglas and Stonebrook; $4,000 Future Working Hunter – Mares, sponsored by Penelope Ayers & Ravens Wood Farm; and the $4,000 Future Working Hunter - Colts & Geldings, sponsored by Mr. & Mrs. Tim Goguen/Boggs Hill. The Future Hunters will compete on Monday and Tuesday, October 4-5. On October 6, the top six horses from each section are invited to compete in the Show Place Arena in the $20,000 Added Future Hunter North American Championship, sponsored by Mr. & Mrs. Douglas Wheeler/Cismont Manor Farm & Kocher Tack. Last year's big winner was Showman, ridden by Sandy Ferrell of Bernville, PA, who picked up the Grand Future Hunter Championship and won the Future Hunter North American Championship. Ferrell, who runs her business Royall Show Hunters Inc., believes that the Future Hunter divisions are a great addition to her young horses' education. Having five different divisions for the Future Hunters is another aspect that Ferrell likes. “It's nice how they split up sections so that's there an even playing field to who can qualify. The addition of the 3'3” division will be interesting because it may bring in more experienced horses too,” she remarked. The popular $5,000 WCHR Emerging Pro Challenge will consist of two rounds this year, giving more riders the chance to compete in the Show Place Arena and win the Bittersweet Perpetual Trophy, donated by Rachel B. Kennedy. In addition to their Challenge class, Emerging Professional riders will have the chance to compete for the $1,500 Future Hunter Emerging Pro Bonus Awards. 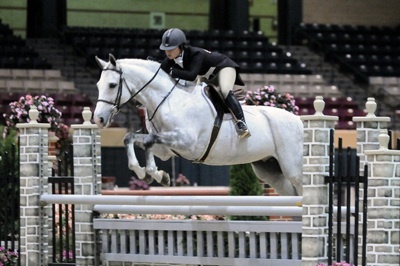 -Rider has never placed in the top 10 of the WCHR Professional National standings. run at 3"6" or higher at the following shows: Devon, Capital Challenge, Pennsylvania National Horse Show, Washington International Horse Show, and/or The National Horse Show. To see the future of equestrian sport this year, join us at the Capital Challenge Horse Show. As always, if you can’t attend, remember you can log on to www.equestriansport.tv to see all the action live. Highlights of the Capital Challenge Horse Show will include the North American Equitation Championship (Oct. 3), the Taylor Harris Insurance Services (THIS) National Children’s Medal Finals (Oct. 3), the World Champion Hunter Rider (WCHR) Emerging Pro Challenge (Oct. 6), Future Hunter World Championship (Oct. 6), $2,500 WCHR Amateur-Owner 3'3” Challenge (Oct. 7), the North American Junior/Amateur-Owner Jumper Challenge Cup (two rounds held on Oct. 8-9), the ARIAT National Adult Medal Finals (Oct. 8), and the WCHR Professional Finals (Oct. 8).